For us North Americans, most sources for our shopping trends are from…North America! But here’s your chance to follow technology trend opinions from a respected source in Europe. Feast on the Berlin-based first IFA Tech Trends report for 2018. It’s based on real-time point-of-sales data from partner GfK, a global leader in market and consumer information. Here is their report. What’s in for you? A better understanding what smart buyers from around the world, radiating from Europe, are looking to buy, or not, in technology. In fact, they are smarter buyers than us because they consider pricey items as an investment not the latest fad. Berlin, 25 January 2018 – Premium products continue to power powering broad segments of the market for consumer electronics, whether it’s for smartphones, mobile computing, TVs or wearables, the first IFA Tech Trends report has found, with insights of the team behind IFA Berlin 2018 the world’s largest consumer electronics show both in terms of visitors and business deals struck. Here are the key trends in real-time, as the consumer electronics industry goes into 2018. “The market for consumer electronics is more dynamic than it’s ever been. However, amidst all the product launches and industry events, it’s easy to lose sight of the big trends. Most importantly, it’s easy to lose sight of real consumer behaviour. That’s why we have launched the IFA Tech Trends, to offer a timely reality check that shows what’s really happening on the ground, in shops online and in brick-and- mortar stores offline,” said Jens Heithecker, Executive Director IFA Berlin. The smartphone market continues to set records: In 2017, manufacturers sold of 1.478 billion smartphones with an average price of $323 (USD). 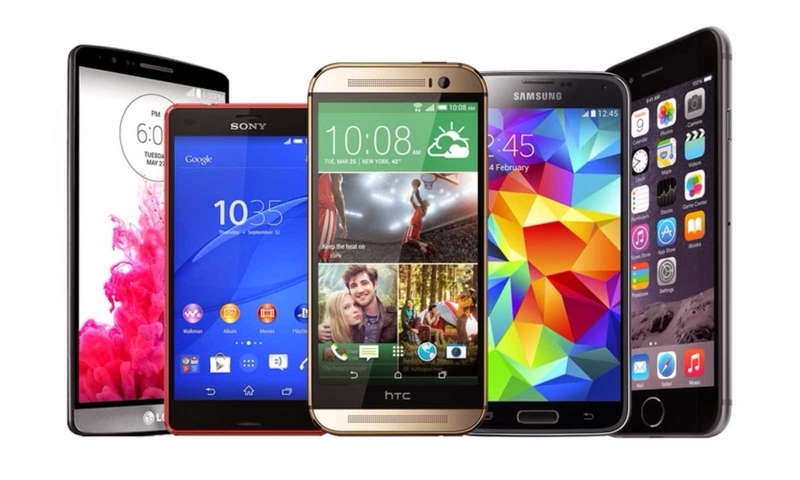 In terms of numbers, it’s countries in Emerging Asia and Central and Eastern Europe that are driving sales, while customers in North America, Western Europe and Developed Asia are snapping up premiums phones – with larger screens, more data storage and processing power, longer battery life, faster charging, and features like better water and shock protection. However, don’t write off features phones just yet: in developed markets, feature phones specifically designed for the elderly are hugely popular, while in markets like Russia and India, sales of cheaper smartphones continue to gain importance. 2017 was the year when wearables started to gain traction. Leaders of the pack are Smartwatches, which are beginning to take over from more basic fitness trackers. One category to watch are “earables” – in-ear headphones that also carry sensors and plenty of memory for music double up as fitness coaches. Another popular segment are locators with inbuilt connectivity and GPS, to find children or seniors (that’s especially true for Asia, where every third wearable device sold is a locator). 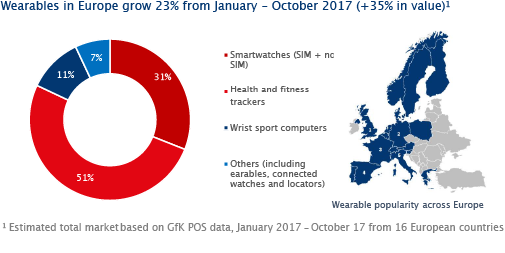 In Europe, demand for wearables is up more than 23% (and 35% in terms of value), with similar growth rates in Asia. “Smartphones still rule supreme, but 2018 could also be the year of the wearables, as these devices reach the right balance between cost, features and usability. The most fascinating aspect of this markets is that so many different industries are offering their take on the category – from mobile phone manufacturers to healthcare specialists to traditional watchmakers and many in-between,” said Jens Heithecker, Executive Director of IFA Berlin. The rise of the tablet and the decline of PCs were the big tech story of a few years ago, but now we seem to have reached “peak tablet”. During the past year, retail channel sales of media tablets fell by 18% compared to last year (Jan-Oct). This was particularly driven by a sharp decline in emerging markets,which account for 34% of demand for computers (desktop, laptops and tablet computers). The fall in the tablet market coincides with a slow recovery for personal computer sales – after years of decline.Notebook channel sales slightly recovered to decrease “only” by 7% compared to last year (Jan-Oct), but were strongly supported by improved sales for convertible notebooks with touchscreens and ultra-thin devices. Ultra-thin notebooks meanwhile represent 10% of the global retail demand (excl. Northern America) for computing devices,particularly driven by Western Europe and APAC as key regions. 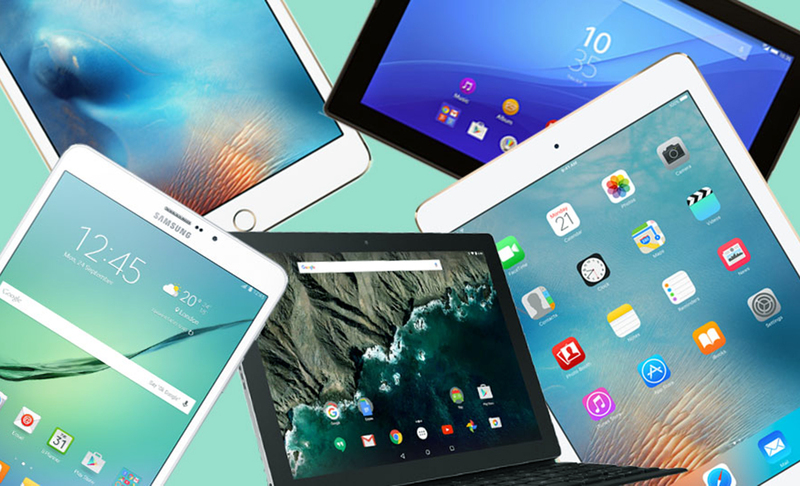 Make no mistake: tablets are still very popular and for many consumers the go-to device for media consumption and computing on the go, but the rise of the segment seems to have been stopped and even reversed for now. “Today, computing means mobile computing, and until recently consumers had to make a choice: devices that were geared either towards media consumption or productivity. Productivity is finally winning out, but new form factors like ultra-thin devices and convertible notebooks are making the choice easier,” said Jens Heithecker, Executive Director of IFA Berlin. US consumers like their television screens large, but they are not the world champions when it comes to screen size. Right now, that accolade belongs to Chinese consumers. The average size of TV screens sold in the United States is expected in 2020 to be over 52 inches, while Chinese consumers will push their country’s average even higher, to a whopping 54.1 inches. To compare, just across the sea Japanese television viewers are expected to buy new TVs with an average screen size of 40 inches. The size preference of European consumers is closer to the US market, with an average screen size of 48.9 inches for TVs bought in stores and online. TVs are not only getting larger, but also smarter. 68% of all TVs sold are now “smart” TVs, while 32% can deliver Ultra-High Definition or “4K” images. “Size, picture quality and ‘smarts’ are they key drivers of consumer demand. It’s obvious: mobile devices complement TVs, they will not kill them. Given today’s TV experience, I’d say cinema has lost its technological edge. TV is the new cinema,” said Jens Heithecker, Executive Director of IFA Berlin. Smart appliances and Internet of Things devices for the Smart Home are seeing triple digit growth rates, as consumers are finally starting to believe the industry vision for the connected home. That’s especially true in the United States, which is – despite consumer scepticism – still the largest market for smart devices. However, you should also look East, because when it comes to buying smart appliances for the home, it’s consumers in China, Korea and Japan that are setting the pace, especially when compared to shopper sin Western Europe. A surprise market to watch is Iran, where smart refrigerators and washing machines are extremely popular. 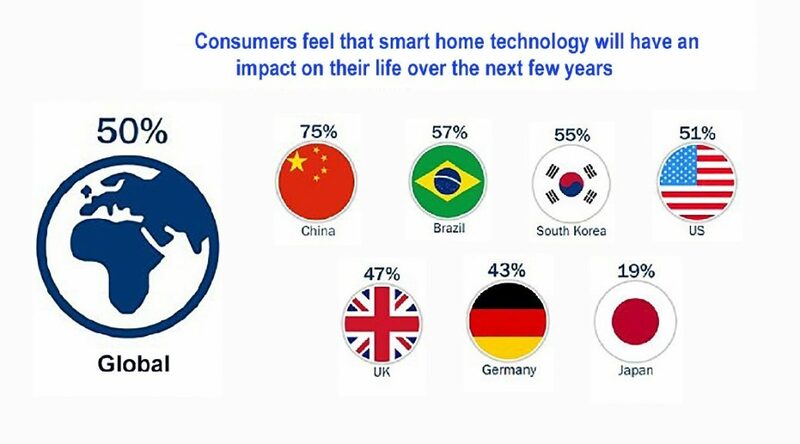 This may not come as a surprise, as even two years ago GfK saw that consumers in China are most enthusiastic about the promise of the Smart Home, with 75% saying that it will make an impact on their life. 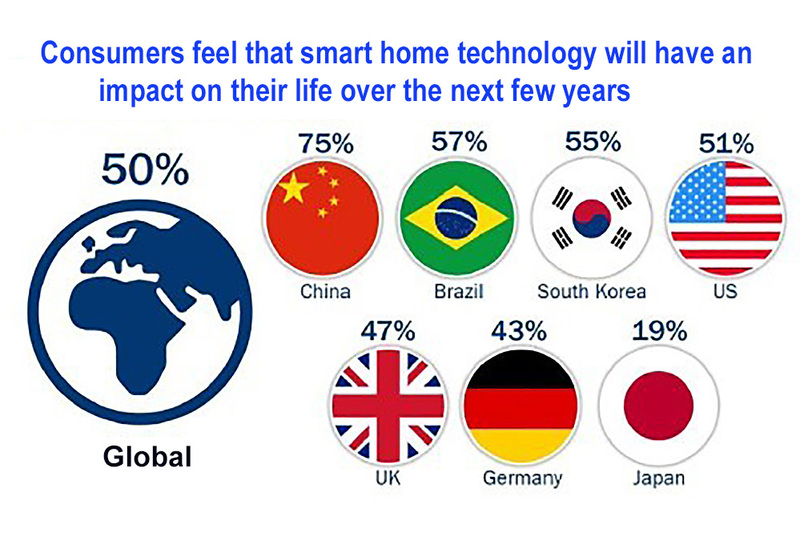 In the United States, just 51% of consumers shared this optimism, while in Japan a mere 19%believed the Smart Home promise. “The technology industry still has a lot of explaining to do. A measly 16% of consumers say that they“know a lot” about Smart Homes. However, we at IFA believe that – just as with smartphones some 5 or 6 years ago – the technology is about to reach an inflection point, where we can really expect it to takeoff,” said Jens Heithecker, Executive Director of IFA Berlin. 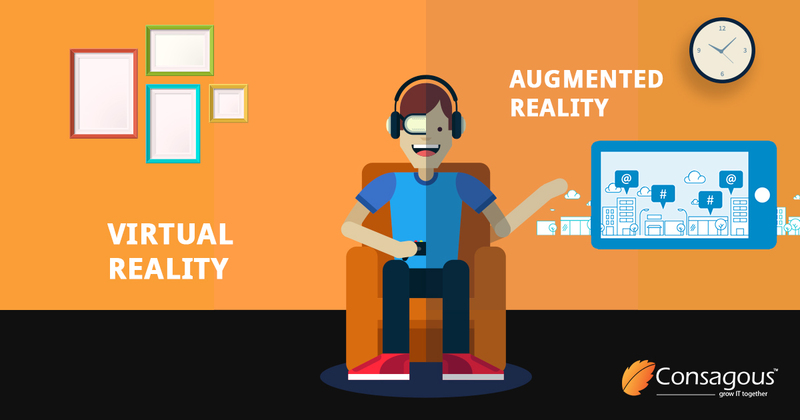 The market for Virtual Reality and Augmented Reality continues to tread water, as consumers wait for the killer content and applications that make owning the technology a “must”. The market is also highly polarised – split between cheaper VR Head mounts where users insert their smartphone for the experience, and much more expensive VR Head-Mounted Displays that are tethered to a powerful PC or games console. Intriguingly, the main customers for either technology are businesses, who buy these devices for highly specific business usage. Another startling insight is that the main sales channel is not online but the real world – offline retail stores. It suggests that for VR, it’s the immediate real-life experience of the technology that lures buyers into the virtual reality. So far, AR is still too small a market to provide any insights on consumer behaviour. “VR has a chicken-and-egg problem. Consumers will rush to buy once there’s great content to enjoy, while content production is slow as long as consumers are not buying enlarge numbers. While the consumer market is treading water,business applications are likely to be the main drivers of the market,” said Jens Heithecker, Executive Director of IFA Berlin. The IFA Tech Trends report is based on real-time point-of-sales data and comprehensive consumer surveys conducted by GfK. IFA is the world’s leading trade show for consumer electronics and home appliances. It will take place at the Berlin Exhibition Grounds (Expo Center City) from 31 August to 5 September 2018. Alongside the event, IFA Global Markets will take place from 2 to 5 September at STATION Berlin, bringing together buyer sand OEMs / ODMs at Europe’s largest sourcing show for the electronics sector.